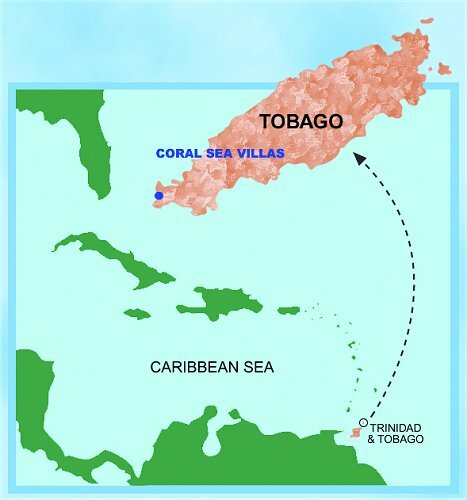 Tobago is part of the twin-island republic of Trinidad & Tobago, located at the southernmost end of the Caribbean chain of islands. Tobago's Crown Point Airport is served directly by several airlines in North America and Europe, and from Trinidad by many 15-minute shuttle flights daily. Bon Accord is just a five-minute drive away from the Crown Point International Airport and fifteen minutes' walking distance from the golden-sand beaches of Pigeon Point and Store Bay. If you are persuaded to take a stroll, shops, restaurants and other conveniences are located just a short distance from the Bon Accord Estate.